We are a leading Manufacturer of la cal from New Delhi, India. 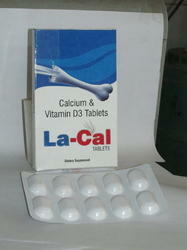 Only quality as our main concern, we are busy in manufacturing, trading, exporting, and supplying Calcium Tablets. Our pharmaceutical experts who has years of practice in this medical area use only best grade chemical ingredients for formulating these tablets. The Calcium Tablets we produced are widely used for preventing a number of bone conditions caused by low level of calcium like osteoporosis and osteomalacia.